As alluded to several times recently, I've been anxiously awaiting the start of USPSA matches this Spring. One of the main reasons is this will be my first full year of matches. 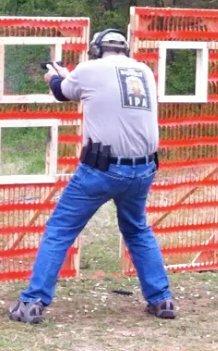 I "discovered" USPSA last July after shooting a few IDPA and steel matches. My main accomplishment last year was figuring out the rules, and getting my nerves under control. While the latter will never be conquered totally (nor should it) this year I intend to focus on improving specific skills, and at the same time learning how to better plan my strategy. I'm still new at this game; sharing some highlights here will help me to track my progress. The month started off with the season opening match at Fredericksburg Practical Shooters. I helped set up the match the morning before, which was actually a very enlightening experience. Sure, I got to see the workings of the mind of the match director as he strove to place targets and barricades just right to force the shooter to move and to really think about how the stage should be shot. It gave me some things to think about as I figured out my own strategy of attack. Next up, the monthly match at Black Creek Steel Shooters in Richmond. There's just something extra fun about shooting at static and falling steel. The immediate feedback is also a great training tool. It forces you to really focus on aiming and trigger control. On paper you might score fewer points for being off just slightly; on steel you may simply miss the target all together. One of my meager attempts is shown in comparison with better shooters here in a video made by another competitor. In a rare treat, Colleen was able to come along to this match and video my shooting. Watching those videos pointed out a number of things I can work to improve, which is great. But even better was having her along for the day! My final match in April was the highlight of the month for me. The match at North Mountain Practical Shooters was one where things just seemed to flow well. I shot a lot of A's, with just two misses the entire match. I think I scored my second highest percentage ever on a classifier stage. I also had my best finish to date in a match, even finishing one stage 5th out of 15 shooters in my division. There were things I could have done better, sure, and I will next time. Overall, a very, very fun match. Next month I'm participating in the VA/MD 2011 Section Championship, held right here in Fredericksburg. I'll get in a few more practice matches before then. I'm looking forward to testing myself on the same course of fire with a large cadre of expert and more experienced shooters. And, if you see me at any local matches, be sure so say "hi." Look for the shooter in the craft beer t-shirt. I got "I LIKE BEER" out of your blog. Is that true? :) Kidding. You're improving every time out!